To some it was that voice. To others it was the songs she chose. And to others it was the fairy tale way a small-town West Virginia girl made it big, and then tragically died so young in a plane crash. 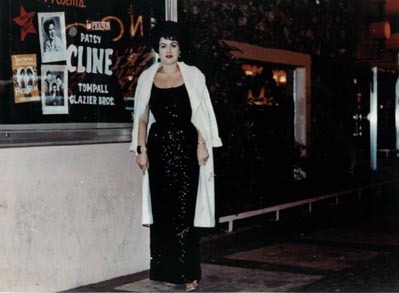 Patsy Cline has been the subject of hit films (Sweet Dreams), Broadway plays (Always, Patsy Cline), and numerous biographies (Honky Tonk Angel). She still sells millions of records annually, even though she has been dead for more than 40 years. She was a star who left well before her time, in the same vein as Jimmy Dean, Hank Williams, Marilyn Monroe, and Elvis. This book is a companion to an MCA CD tribute to Patsy Cline featuring performances of Cline's best-loved songs from current music superstars such as Reba McIntyre, Natalie Cole, Lee Ann Womack, Dianna Krall, Trisha Yearwood and others. In addition to quotes about Cline's influence on their careers from the artists participating in the record, it will contain reminiscenses from some of Cline's contemporaries such as Brenda Lee, Loretta Lynn, and Harold Bradley. Remembering Patsy is the first collection of photographs of Patsy Cline ever released in a book. The movie about Patsy's life and career. Patsy's own voice singing to Jessica Lange's lip synching. The movie doesn't get all the facts right, but it's enjoyable in any case. Click on the boxcover image to order it now from Amazon.com at a special price! "SWEET DREAMS - THE REAL PATSY CLINE" by Doug Hall Click on the bookcover at the left to link directly to Amazon.com to order this item now at a special price! 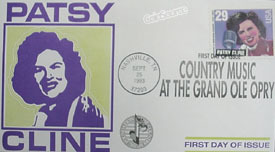 Order all of your Patsy Cline CD's, tapes and videos by clicking on this link to CDNOW.COM! A large part of this book was published in 1981 by Leisure Books, under the title Patsy Cline. This updated work (1993) includes a forward by Patsy's friend, the late Dottie West. Nassour extensively interviewed Patsy's family and friends and developed the material into this fine book. This is the definitive Patsy biography. I highly recommend it. (ISBN: 1-55850-476-1), features an introduction by country singer Carlene Carter. The book weaves into the tale of Patsy's life, an examination of the music itself, offering insight into each song. Also includes interviews with some of today's hot country stars talking about Patsy's influence on their music. Another good one -- contains some photos heretofore unpublished. (ISBN: 0-06-016696-7). The introduction to this one is by Patsy's friend Loretta Lynn. Another excellent biography, this one examines the country music business itself in the 1950's and 1960's, and Patsy's role in bringing country music to the mainstream, as the first successful female crossover artist, and how she opened doors for the females who followed her. Also relies on interviews with people who knew and worked with Patsy. The first edition (hardcover) of this book is out of print (though sometimes available at e-Bay auctions). Clicking on the bookcover above will take you to the link at Amazon.com for the new paperback edition. Finding her Voice (The Saga of Women in Country Music) by Mary A. Bufwack and Robert K. Oermann, Crown Publishers, Inc., 201 East 50th Street, New York, NY. 10022 (ISBN: 0-517-58114-0) This interesting 1993 book has a thirty eight page chapter titled "The Nashville Sound: Patsy Cline and "The Grand Ole Opry" and also highlights the female stars that Patsy opened the door for, like Loretta Lynn, Dottie West, Brenda Lee, and others.